The Harlem River is a tidal strait that allows water to flow from the broad Hudson into the East River (the Hudson and East Rivers meet at the southern tip of Manhattan Island). 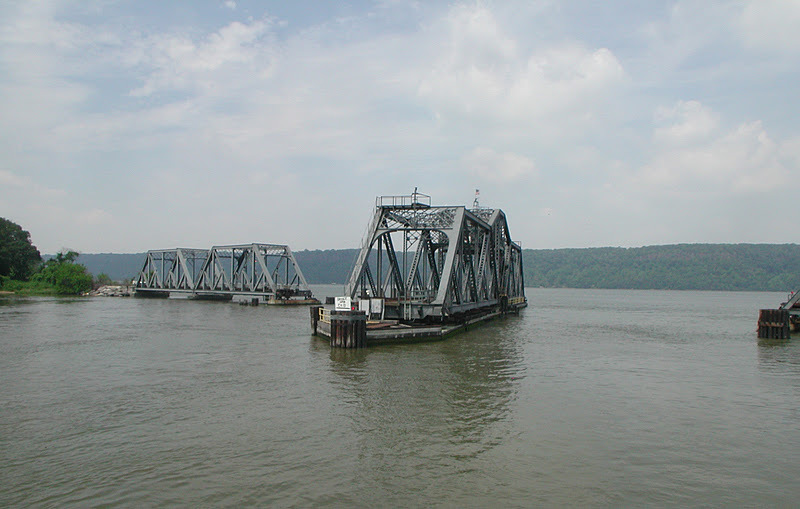 The Spuyten Duyvil Swing Bridge is along the east bank of the Hudson River and blocks entry into the Harlem River when it is closed. The term Spuyten Duyvil refers to the swift running creek that was at this location before it was dredged by the US Army Corps of Engineers to create the current north end of the Harlem River. The name means 'devils spout' and refers to the wild currents that flowed through the creek. The current bridge at the north entrance to the Harlem River was built in 1899 to replace an earlier bridge built by the New York and Hudson River Railroad. The current bridge has a 290 ft long swing span, 610 ft of total length, and only 5 ft of vertical clearance when it is closed. Trains stopped using the bridge in 1982, it was struck by a ship the following year, but it was repaired for use by Amtrak a few years later to carry passenger trains to and from Pennsylvania Station. New York City's Bridges: Spuyten Duyvil Bridge by Mark Yashinsky is licensed under a Creative Commons Attribution-NonCommercial-ShareAlike 3.0 United States License.